Rent it for $200/day ……………………………………………………………. The Rotadairon attachment does the job of multiple people and machines simultaneously. 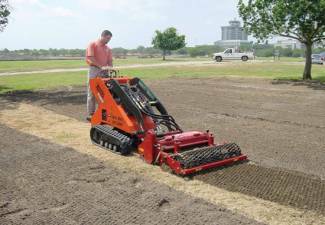 Its features allow you to do complete soil renovation, preparation, grading, and finish work like no other machine. Powerful, hydraulic driven tiller claws dig turn up soil 6 inches deep while simultaneously burying large rocks. An adjustable “compacting” bar follows, allowing you to control how soft or hard the soil is after making your pass. Lastly, a rolling grader leaves behind a perfect pass of topsoil ready for seeding. This rotadairon rental is available exclusively at Shaughnessy Rental! The Shaughnessy Rental rotadairon attachment works exclusively with the Shaughnessy Rental SK650 front end loader!